In 2004, a bullet ripped away Connie Culp’s nose, cheeks and upper jaw. Metal fragments sprayed into her skull and stripped her face away, leaving nothing except for her eyes, her chin and forehead. Without her nose, she could not smell. She breathed through a tracheostomy — a surgical opening in her neck. Without lips, she could barely speak. But Tuesday, when Culp, 46, the first recipient of a face transplant in the United States, stepped in front of the cameras at a news conference, she was whole. In a soft voice, the Ohio mother of two repeatedly thanked the medical staff and the deceased donor whose nose, upper lip, cheekbones are now hers. “I want to focus on the donor family that allowed me to have this Christmas present,” she told reporters gathered at the Cleveland Clinic, where her surgery took place. In December, Culp underwent a 22-hour transplant surgery. Although the hospital announced the facial transplant at that time, the patient had remained anonymous until the news conference. During the surgery, tissue from a deceased donor’s face was shaped and fitted into position. Multiple layers of tissue, bone, muscle and blood vessels, nerve grafts and each artery and vein were connected. 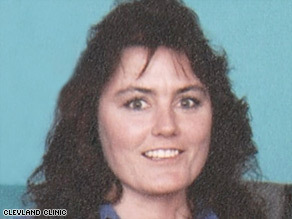 Culp received a nose, lower eyelids and upper lips, as doctors filled in the missing components of her face.